After countless bike demos and races, I've wised up and added this baby to the tool box. 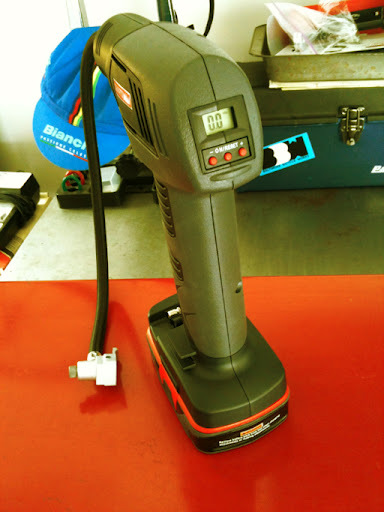 The Craftsman air inflator with digital pressure gauge and auto shut off. The battery and charger are separate so I splurged for the Li-Ion battery set up over the Ni-Cad version. Ni-Cad batteries develop memory to them; meaning that if you don't drain them all the way down before recharging again, it nips away at the lifespan of the pack. Li-Ion batteries are capable of putting out more power until they're drained instead of trickling down on power like Ni-Cad packs are known for, eventually dumping on you. Operation of this tool is easy. Just increase or decrease the PSI on the rear display, pull the trigger and you'll be able to creep up that air pressure in the Grifos. Knowing if you're a PSI over or under on race day can make or break you on the first off camber section you encounter on the 'cross bike.